It may seem strange to the average Formula One fan that everyone blames Ferrari, whenever accusations of cheating are doing the rounds, but there is a certain logic to it. Apart from anything else, which other team, in the entire history of the sport, has successfully appealed an FIA decision? And despite all that money and talent, how else could an Italian team beat the Best of British? The question of traction control has reared its head again. 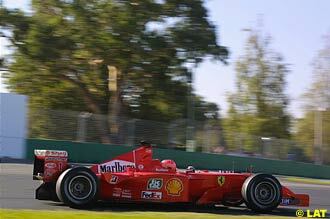 Heinz-Harald Frentzen said something in public that a lot of drivers have been thinking - why do Ferrari engines misfire when pulling away from slow corners? Ordinarily, a misfire is bad news, indicating a sick engine and imminent trip to the pits. But it is also the preferred route to power limitation within the engine, whether to control pit-lane speed, or limit wheelspin out of corners. So, are Ferrari cheating? Well, probably not. Traction control, according to the definition used by the FIA, boils down to systems which use feedback from the wheels to detect, and accordingly limit, wheelspin. Note, that the key word here is "feedback." The modern Formula One engine has a relatively narrow power band, and generally the power comes on unevenly. If the cars were still controlled directly by drivers using the old wire throttle mechanism, things would look very interesting indeed - it would take a remarkably sensitive foot to handle the 800bhp coming on in spurts and starts. However, modern Formula One permits something akin to "fly by wire" in the throttle, permitting the pedal effect to be relayed via a fixed mapping to the engine. As a result, the power appear to come on smoothly as the throttle is depressed, courtesy of this mechanism, referred to as the engine mapping. Teams spend tremendous amounts of time and money pounding the test circuits, attempting to isolate the perfect mapping for their engines. The FIA has ruled that the systems must provide a fixed mapping from pedal to throttle, and cannot incorporate feedback from the wheels. This prevents actual traction control from being used. However, there is little to prevent teams from engineering the system to have a different system for each surface condition. Accordingly, the mechanism can effectively provide the driver with maximum acceleration for any given gear on any surface. And should the mapping effectively starve the engine of fuel in some lower gears - so as to limit the power put down - then there will be a misfire. This is not traction control, or at least, not according to the accepted definition. It's clever use of power limiting technology, which provides a similar effect. And because it is both expensive compared to the real thing, making it a toy for the biggest players, and difficult to differentiate from the genuine article, this is the key reason for bringing full blooded traction control back to Formula One. Max Mosley is concerned. Formula One cars are around five percent quicker this year than last. That means they are travelling around five percent quicker around corners. And that is a big deal. Since the death of Ayrton Senna, Mosley's campaign to control speed in Formula One has centred on keeping cornering speeds down. Adding grooves to the tyres is intended to reduce the footprint in contact with the ground, hence dropping mechanical grip, and forcing drivers to slow more for corners. Yes, cars were slower over a lap, but braking distances were the same, and cornering speeds were not noticeably reduced in the high and medium speed corners: this is the realm of aerodynamics, so the new, lower drag (thanks to a narrower profile) cars allowed plenty of downforce of overcome the reduced grip from the tyres. So, slow corners, where the cars were already slowest, were the most impacted, and accounted for almost all the slowdown. At Melbourne, it was clearly noticeable that some tyres were worn well down. This could be because the teams are driving them right to the limit, or perhaps they are designed that way. In any event, there is considerable concern in media circles that they are being treated as "slicks" in the worn state. A natural consequence is the current speculation that the FIA are going to tighten up their implementation of the tyre rules: grooves to be maintained for the duration. Actually, that is probably what they are not going to do. The FIA have warned the tyre companies that running tyres as slicks will result in the rule coming into force immediately - all cars on that rubber with a single worn tyre will then be disqualified. So neither Bridgestone nor Michelin are playing that game. Worn tyres are - marginally - slower than new ones, though under some conditions they are quicker than the part worn counterparts. 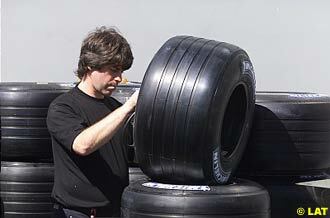 Should the FIA enforce the tyre wear rules, then things get interesting. Teams have to choose between harder rubber, and an extra stop; and given the normal performance advantage of softer tyres, most will go for the latter. This, in turn, means cars will be running with less fuel, and on newer tyres, then under the previous system. In other words, they will be running even quicker than before. The FIA are looking at ways to slow things down, but for quick fixes, that would be the most short-sighted. Forcing the tyre companies to introduce lateral grooves (reducing the tyre footprints) is a medium term solution, but possible. Short term, they have a couple of other ideas, though. Raising the front wing would make a difference, and better yet, picking up the whole car by five millimetres would slow things down. Pedro de la Rosa claims to have a racing contract with Jaguar for 2002. It is believed the team could loan him to a rival team, but it is increasingly likely that at least one existing driver will be moved on. Dario Franchitti is getting ready for another test with Jaguar. The Scot is looking for a better test this time, and hoping it will facilitate moving to the series for 2002. Mark Blundell seems set to test with Prost. His contract would include a "first call" option to replace Mazzacane, should there be any performance problems from the Minardi refuge.